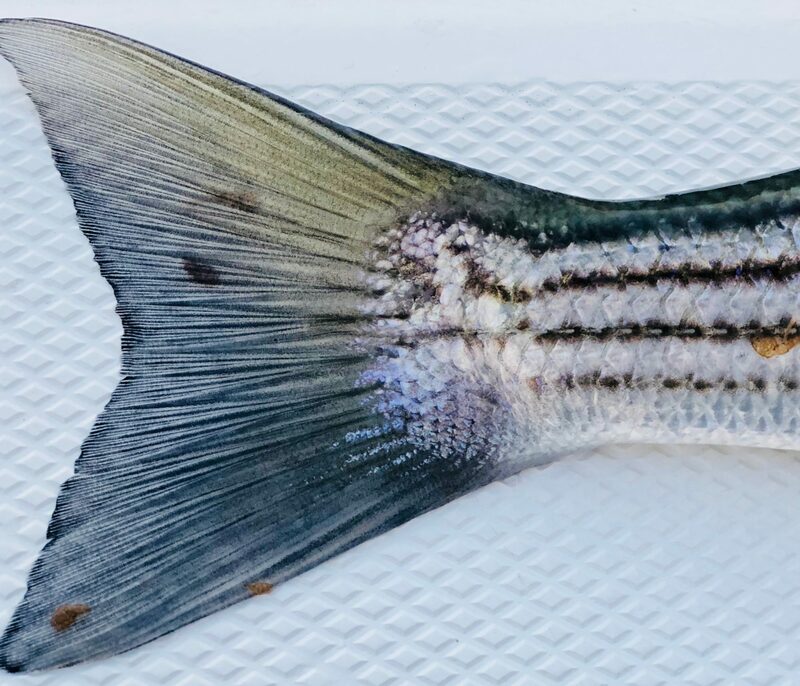 I had no idea what a ‘take’ was until I fooled my first striped bass on the fly. Sure, before that moment, I’d caught plenty of fish on a plug or a softbait and we can all agree that it’s a great feeling. Tough to beat a smashed plug on top and a nice hookset followed by a screaming drag on the spinning reel. I’ve caught on a live mackerel, and this, too, is a blast; watching as the mackerel swims just a little more frantically as it’s being pursued by a hungry linesider. Trolling is cool too. There’s something appealing about the quiet of a just-above-idle outboard, barely moving along in the current when out of no where, the rod bends nearly in half. Yeah, these are all great and fun and effective ways to catch big stripers. But the take on a fly rod? That split moment between strip and pause and strip set, where the fly line is quite literally ripped out of your hand and you have to do the happy dance so the line doesn’t get tangled around your feet? That tiny surge of pure adrenaline, when the jolt of electricity of a real living fish pulses through leader and fly line and rod and hand and directly into your brain? Nothing quite compares to a take on a fly rod. And I mean nothing. Fly fishing is the peak of sportfishing. A schoolie hitting a clouser minnow is an absolute blast on the fly. Can you say that about trolling a tube and worm? Let’s Make Fishing Fun Again. It forces you to appreciate the little things. Making a beautiful double haul on an empty beach or a perfect roll cast into a calm estuary as the sun disappears behind the reeds is a beautiful thing. There’s always something to think about, to practice, to perfect. It’s zen-like. I just told you fly fishing is life affirming. What other grandiose and hyperbolic argument do I have to make to get you to do it? If you have already had the opportunity to experience fly fishing for stripers, or you’re an expert in this field, well, you should still read it because then you can disagree with all of my recommendations and tell me I’m an idiot. So, without further incoherent rambling, here’s what you need to get a few spring-run stripers on the magic wand this year. As always, there will be a “here’s what you need to target them” section and a “here’s how you target them” section. I’m splitting this one up into two blogs because it’s long. Contrary to popular belief and bashing from non-fly fishermen, getting started fly fishing doesn’t have to be a multi-thousand dollar venture. You can have a legitimate setup ready to catch fish for under $400 bucks. As always, I’ll provide a few levels of budget for each recommendation. A note: I’m listing retail prices here. You can find these cheaper used or from the auction site. When targeting stripers, depending on situation and tactics, you’ll be using either an 8wt, 9wt, or 10wt. I find myself using a 9wt pretty exclusively from the boat or beach, so if you’re buying one rod for stripers, buy a 9wt. If you’re splitting time between largemouth in the lakes and schoolies on the flats or estuaries, an 8wt will pull double duty. You may have a tough time casting a big fly into wind with an 8, though. A 10wt will be helpful if you’re fishing from the surf or throwing big flies in windy conditions to big fish. A rod will be highly personalized based on your casting style and skill level. Go to your local shop, like the Goose Hummock in Orleans or the Bears Den in Taunton and cast a bunch of rods. These guys will hook you up. You’ll find one you love, I guarantee that. Here are my picks for the best rods in each price category. This thing is such a killer value. Sweet looking blue blank and a nice fast action make it the perfect budget striper rod. Universally praised as the best cheap rod you can buy And if you break it? Buy a new one. Honorable mention for best cheap rod is the TFO Lefty Kreh Professional Series II. It doesn’t have it’s own section here because I’m having a tough time finding this version online. Maybe TFO is coming out with a new version? We’ll see. Regardless, you can get this one used for really cheap and it’s a beautiful starting rod. I love TFO. Love their warranty and love their products. I have a few BVKs (9wt and 5wt) and they’ve always served me admirably. They have the strength to throw a big weighted line and lift a striper from the bottom, with the sensitivity to make accurate casts. It’s a very light rod. People rag on this rod for it’s super fast action but I like this about it. I overline it a little bit and can cast some big flies into heavy wind. A USA company who makes USA rods. What’s better than that? The original Tradewinds was a favorite among the Northeast striper diehards, but some, especially newer casters, found the action to be difficult to cast. The XS, meaning “Extra Soul” looks to fix this. Most say they don’t need to overline this rod. The 9wt rod should throw 9wt line beautifully. Another positive: the owner is a member on all of the big forums and his customer service is unmatched. Unlike a fly reel for trout, your striper reel actually has to do work for you. It should have an excellent drag, a sensitive and responsive drag knob, and a relatively sealed body (depending on how you intend to use the reel). It also should pair well with the rod you choose. This is another plug to get down to your fly shop and test some out. I bought a BVK (a very light rod) and tried to pair it with a Redington Behemoth (a relatively heavy reel). It did not feel great. So I traded it the Behemoth in for one of the fine reels listed here. (I am not bashing the Behemoth, it’s a really a great reel with a wild drag number for the price. Just didn’t fit my needs). Fly reel manufacturers have gotten really good at making solid and inexpensive die-cast reels. This is an example of one (the previously mentioned Behemoth is another). The Liquid features a pressure-cast aluminum frame and spool and a sealed drag system. It’s a hell of a reel for just over a hundred clams. You can also opt for the “3-pack” which will give you 2 spare spools for only $169. Not a bad deal. Large arbor, lightweight reel that looks stunning on any rod. Cheeky makes some really sweet looking reels, but these things absolutely perform, too. The Boost model features a very quick retrieve, something you need when targeting the funny fish that like to run straight at that boat. Cheeky also offer a “triple play” where you get a carrying case and two additional spools for $350. An absolute workhorse and the flagship of the 3-Tand brand (hey that rhymed). It features a fully-sealed and waterproof housing. Carbon drag system, cold forged steel and all of the other cool buzzwords you want to hear when talking about a fly reel. This reel is a beast. I can’t explain how important it is to test cast a few lines with your new rod. In some cases you may find that the $100 fly lines casts twice as well as the $50 fly line. So then buy that one! Don’t be afraid to spend up on a fly line. A good fly line is essential to getting max distance on your cast. Many rods you’ll be using in the salt will be fast-action, meaning you may need to throw a heavier line to get them to effectively load the whole rod. Many shooting lines and sink tips come a half line weight or even a whole line weight heavier. I’ll talk about these in the gear recommendations. Very simply, there are three types of fly lines: Floating, intermediate, and full-sink. There are also sink tip and intermediate tip, which is what I’ll recommend here. Line discussion can get very complicated between shooting heads and running line and type IV sink and all that good stuff, so to simplify, I won’t mention any of that stuff (well, I’ll mention the sink numbers briefly). We’ll talk more about when to use lines in different situation in the tactics section of the blog, but if I were to choose one type of line to load, it would be a sink tip with a floating or intermediate running line. This will allow you to get the fly down into the feeding zone quicker. Although, I wouldn’t overlook a straight intermediate line, as this will allow you the flexibility to target topwater, shallow holding fish, and deep holding fish. It will just take a little bit longer to sink. This line comes “ridged” (textured for easier casting) in intermediate and floating and “non-ridged” in sink tip. A great casting line designed for chilly water. An excellent and wicked castable intermediate tip/floating running line. A long (37.5) head and a heavier weight will load that fast action rod of yours and give you some very long casts. The Titan series means they up the line a full size making it easier to fully load a faster action rod. This line comes in Int tip, sink 3 and sink 5. This is a perfect line for turning over big mackerel patterns to bass holding deep. The number coming after the sink tip type indicates how many inches-per-second the line will sink. I saved the best for last. Choosing flies can be an exhausting thing if you’ve never looked through an online forum or walked down the fly section of a shop. Fly anglers, like all anglers, get really hung up on very specific patterns with very specific colors, and these anglers probably do this for very good reason: they have confidence in something and they catch fish with it. But for simplicity’s sake, if you’re loading your box for the whole season, there are a few flies that you’ll absolutely need in your box. For fly storage, I use a few of these that you can find at the Bear’s Den. What an awesome read! I’ve been dancing around the fly fishing question for about 24 months, shall I, shan’t I – well now I’m going to make the step and rig a fly rod for use from my Hobie Outback this season. I appreciate your recommendations, now to get to work with research, looking for deals and making a selection. Excited!! Thanks for reading, Rob! I get the sense after your first striper on the fly you’re going to be hooked. I’ll let you know if I see any good deals pop up.